Have you come across the Cadoodle yet? If you are interested in learning about this curious cross breed, you have come to the right place. 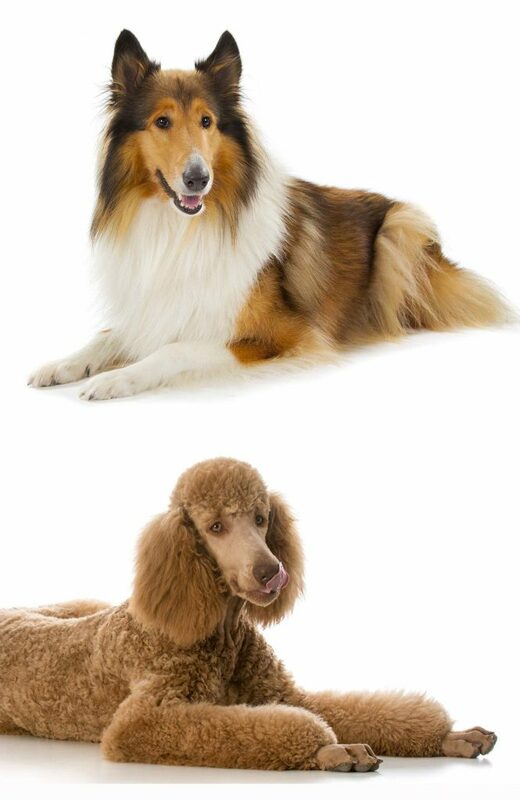 Welcome to your complete guide to the Collie Poodle mix. Here we will look at each of the parent breeds of this charming hybrid so that you can see if he might be a good match for you. The Cadoodle, also known as the Colliepoo and the Colliedoodle, is said to be a wonderful companion dog suited to energetic and fun-loving families. Gentle and sweet yet loyal and protective, the Cadoodle sounds like the ideal pet. The best way to determine what a mix breed pup will be like is to look at the parent breeds separately. But first, let’s look at the reasons for cross breeding and the controversy surrounding designer dogs. Why do we mix breeds? Crossbred dogs, like the Cadoodle, have become rather prevalent of late. A Poodle crossed with anything seems to be the most popular of them all. The reason behind crossbreeding is to reduce and ultimately to eliminate inherent disease and illness common to a significant number of purebred dogs. Unfortunately, the gene pools of pedigree dogs have become smaller over time resulting in inbreeding between related animals. It is thought that widening these gene pools by cross-breeding will lead to healthier offspring. In theory, this line of thought does seem to make sense. The designer dog, though, is a very contentious subject. Breeders of pedigree dogs staunchly disagree with any mixed breeding and believe that their breed’s lineage should remain pure. They argue that purebred dogs are just as healthy as cross breeds and that all types are susceptible to illness and disease. Pure breed supporters maintain that the progeny of any crossbred animals will dilute precious pedigree lines and result in nothing more than mutts, mongrels, or whatever you want to call them. However, the difference is that a designer dog is a first generation mix. This means that they are the product of two purebred parents of entirely different pedigree breeds. Healthy specimens of these breeds are specifically chosen as parents in order to create a new and improved variety. Whether this principle works or not is a matter of great debate. No matter which side you favor, it is clear that first generation mixes are here to stay. To gain a further understanding of what we might expect with this particular breed mix, we will now explore the Collie and the Standard Poodle. Although the origins of the Collie not known for sure, it is thought that they may have been brought to Scotland by the Romans almost 2000 years ago. The original Roman hound bred with the native herding dogs of Scotland over the years. This is how the Collie that we now know today came to be. Shepherds needed a breed which was agile, fast, hardy, and able to work in all weathers. The Collie fit the bill perfectly. By the 18th Century, the Collie called the Scottish Highlands his home. He had become an adept shepherding dog. Queen Victoria fell in love with the breed during visits to Balmoral in the Highlands of Scotland in the 1860s. Once the Queen procured a Collie, the popularity of the breed soared. Later, the Collie was immortalized in print as a loyal and brave companion by Albert Payson Terhune in Lad of Sunnybank and by Eric Knight in Lassie Come Home. Following the release of Lassie Come Home, the story was developed into movies and a much-loved TV show, aptly named Lassie. With this sort of stardom, the Collie arguably had become the most famous breed in the world, and was adored by millions of children. The Poodle is widely considered to be a French dog but is, in fact, thought to originate in Germany. Although the Poodle has a reputation as a pampered lapdog in modern times, he was actually bred as a diligent water retriever. The German name for the Poodle is Pudelhund, which translates to “Puddle dog” in English. Over time, the popularity of the Poodle escalated in Europe, where he became favored by the French aristocracy in particular. With his exceptional intelligence and superb nose, the Poodle also often moonlighted as a prolific truffle hunter. The dramatic show coat actually came about from tradition and practicality; the rear end was shorn to assist swimming, while the front was left coated to protect vital organs and joints from the cold. The origins of crossbreed dogs are rarely known. This is true of the Collie Poodle mix. What we do know is that both parent breeds are descendants of working dogs, with high intelligence and vigor. The only way to determine what Cadoodle puppies could be like is to look at the size, characteristics, and temperament of each parent breed in turn. The Collie is considered to be medium to large in size and typically stands at 22 to 26 inches at maturity. His weight can range from 50 to 70 pounds. The Standard Poodle should stand at over 15 inches at the shoulder. Those less than 15 inches are classed as Miniature. Weight-wise, he should be between 50 and 70 pounds, depending on gender. As a hybrid, the Cadoodle could be at either end or anywhere in the middle of these ranges. The best-known feature of the Collie has to be his magnificent coat. The rough coat variety which we refer to here is much more popular than his smooth coated cousin. Ideal for protecting him from all weathers, the coat is harsh in texture and long and dense everywhere but the head and legs. There are four recognized colors in the US, these being Sable and White, Tri-color, Blue Merle and White. The White Collie is considered to be undesirable in the UK, where only the three other colors are recognized. The rough coated Sable and White is probably the most acknowledged thanks to the famous Lassie. A Collie’s should be dark and almond shaped, except for the merle, where they may be flecked. They should be clear and bright, creating an air of inquisitiveness. Instantly recognizable by his dense and curly coat, the Poodle should exude an impression of elegance and dignity. The harsh textured coat may come in a variety of solid colors including white, cream, brown, apricot, black, silver and blue. Nonsolid colors are highly undesirable. Eye color can differ according to coat, but the eyes should be almond shaped, dark and full of intelligence. It is worth remembering that a Collie Poodle mix could take on any of these characteristics. This could even result in a Blue Cadoodle! Due in part to the influence of Lassie, the Collie is considered to be an ideal family dog and a great companion for children. It is true that the Collie appears to have a fondness for youngsters and is certainly loyal and protective of his family. The Collie should be friendly and kind in nature with no trace of aggression or nervousness. The Poodle, being affectionate and caring, is also an excellent family dog. He is clever and mischievous, and will form a strong bond with his family group. The Poodle does not favor one particular family member as happens with some breeds. As both come from working backgrounds, their instincts remain. With training and socialization, they can grow to be well-balanced companion dogs. A mix of these breeds could mimic either parent but he is likely to be incredibly intelligent and boast a beautiful coat. You may suppose that the fabulous coat of the Collie would require high maintenance. This, however, is not necessarily the case. Daily brushing and frequent bathing are not actually necessary. Instead, once every one or two weeks should suffice. 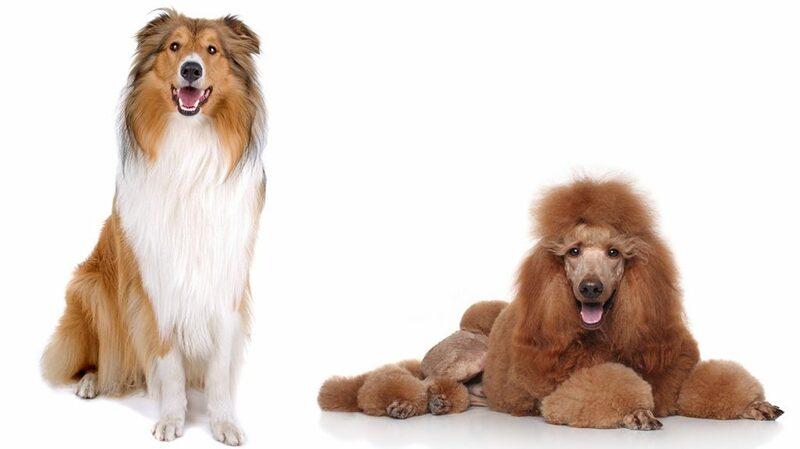 The Collie is known for its cleanliness and is not considered to have the “doggy” smell associated with many breeds. The breed does molt seasonally, however, and so brushing should be adapted accordingly. The grooming requirements of the Poodle are rather different. Ideally, daily brushing is needed to keep knots and mats at bay. Sporting a non-shedding coat, the Poodle is an excellent choice for allergy sufferers. As with all dogs, ears and eyes should be checked weekly and nails kept short and tidy. As this is a mixed breed, the Cadoodle can inherit health problems from either breed parent. Therefore, it is worth being aware of the most common issues. The Collie is expected to live for 12 to 14 years and is considered a healthy breed in general. They do often have a tendency for adverse reactions to a number of commonly used drugs. This is known as the MDR1 Mutation. This can be extremely serious, even life-threatening. It is highly important to test for this gene so that alternative drugs can be used. Collie eye anomaly (CEA) and progressive retinal atrophy (PRA), are both genetic eye diseases known to occur in the Collie. The lifespan of a fit and strong Standard Poodle can be anywhere from 10 to an impressive 18 years. He too can suffer from progressive retinal atrophy and may be prone to skin conditions such as sebaceous adenitis and melanomas. Addisons Disease and Von Willebrands Disease (vWD) are likewise known to befall the Standard Poodle. Others issues to look out for in both breeds include bloat, epilepsy, heart disease, hypothyroidism, hip dysplasia and elbow dysplasia. As the Collie and Standard Poodle are both highly intelligent, training should be relatively straightforward. Positive reinforcement training is always recommended and it is great to use this time to also play and bond with your pet. Similarly athletic, these breeds need regular exercise and so your hybrid pup will probably need it as well. He is smart, and so is likely to develop wayward behaviors in the home if bored. A game of fetch outside is great fun and will wear him out. Agility and obedience training are useful ways to engage his mind and body. Puzzle games will keep him occupied and out of trouble. Would a Cadoodle suit my lifestyle? The Collie Poodle mix will want to spend all of his time with you. He craves human company and attention. Therefore, if your house is empty all day, then this cross-breed is not for you. If your household is always busy with activity and full of energy, then the Cadoodle could be the perfect fit. He will make an amazing and devoted family pet provided that he is socialized with adults, children and other animals from a young age. How do I go about getting a Cadoodle puppy? As mixed breeds are not recognized by official breed clubs, the easiest way to find Cadoodle puppies is online. However, you should be very cautious if using this method. We realize that it will be difficult to say no once you set eyes on an adorable little puppy. So it is essential that you research every breeder that you are considering in advance. Sadly, puppy mills are widespread and ruthless breeders can be very convincing. Speak to any potential breeder before visiting and ask lots of questions both before and while you are there. Insist that the parent breeds have been genetically tested and have clear health scores. If something doesn’t feel right, trust your instincts and move on. Finally, don’t rule out rescue as there are always many pups waiting for loving homes. E. Bjerkås. 1991. Collie eye anomaly in the rough collie in Norway. Journal of Small Animal Practice. P. Bedford. 1989. Control of inherited retinal degeneration in dogs and cats in the United Kingdom. Journal of Small Animal Practice. M. Frazer et al. 2011. Sebaceous adenitis in Havanese dogs: a retrospective study of the clinical presentation and incidence. Veterinary Dermatology. T. Famula et al. 2006. Heritability and complex segregation analysis of hypoadrenocorticism in the standard poodle. Journal of Small Animal Practice. W. Dodds. 1970. Canine von Willebrand’s disease. The Journal of Laboratory and Clinical Medicine.